Just a few short years ago, there were not that many dropper post contenders on the market - and just a few short years before that, your seatpost clamp was your only ticket to more fun on the descents. Fast forward to today, and there are more than 20 viable options for those looking to drop their seats at the push of a button. Or lever, as the case may be. 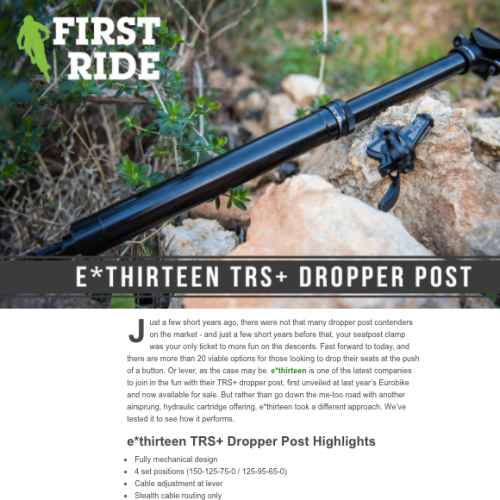 e*thirteen is one of the latest companies to join in the fun with their TRS+ dropper post, first unveiled at last year’s Eurobike and now available for sale. But rather than go down the me-too road with another airsprung, hydraulic cartridge offering, e*thirteen took a different approach. We’ve tested it to see how it performs.